Welcome to our Hot Water News & Energy Saving Tips Newsletter for May 2017. In this edition we’ve featured details of one of the worst hot water installation jobs we’ve ever seen. After more than 20 years in the business we thought we’d seen it all – we were wrong! Scroll down to see for yourself. Running out of hot water? Excessive energy bills? As the weather cools, we naturally start enjoying longer, hotter showers. A repercussion of which is running out of hot water and higher household bills. 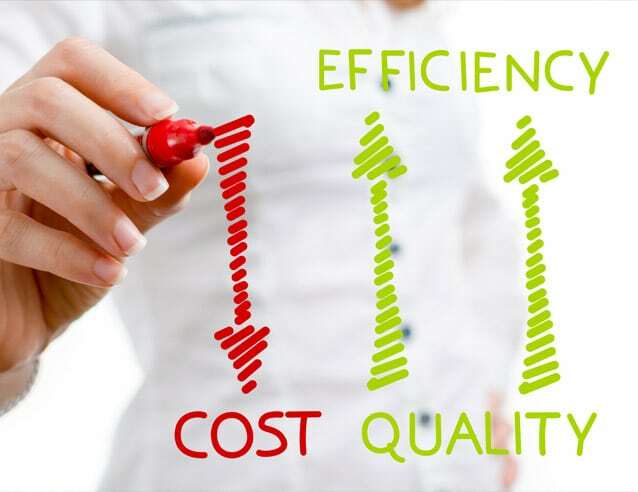 At this time of year we always notice an increase in calls from people seeking quotes to upgrade to bigger, more energy efficient hot water systems. Below we’ve included some tips on how you can save money on your bills and the cheapest hot water systems to run. Can you guess what’s been living in this hot water tank? And finally, we’ve featured a cryptic photo taken at a job recently that we’re sure will stump most people. Can you guess what destroyed this customer’s hot water system? Scroll down to check it out. In the meantime, if you have any questions about your existing hot water system, how we can help you save money on your hot water bills or any other hot water related matter, please don’t hesitate to contact me direct. 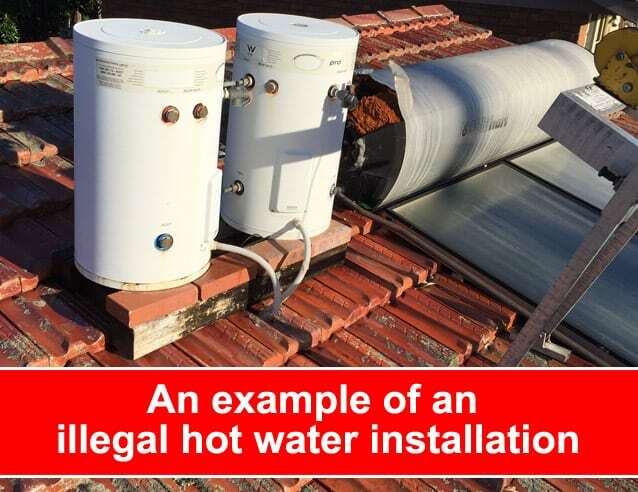 When you think you’ve seen it all in this business, this solar hot water heater repair job on Sydney’s Northern Beaches took the term “hot water installation” to a whole new level! When we arrived onsite and climbed on the roof what we found was very interesting – and extremely concerning. 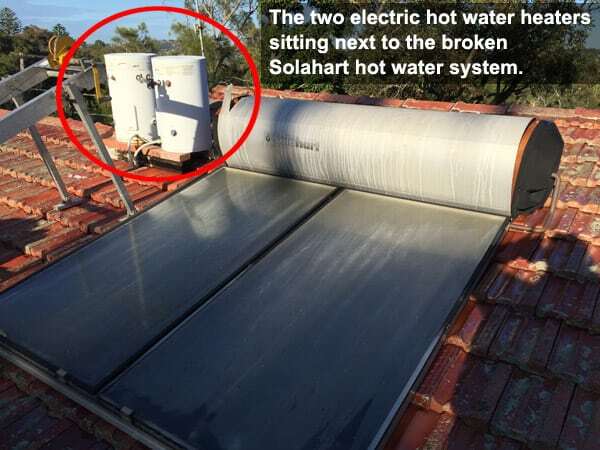 There were two 50 litre electric hot water heaters sitting on a piece of timber next to an old Solahart solar system. After some detective work we ascertained that the old Solahart system must have broken but the previous owner, in the process of selling the property, didn’t want to spend the money installing a new solar heater so asked a “plumber” to install the two electric hot water heaters onto the roof as a temporary fix until the property sold. The setup devised by the previous owner’s “plumber” (and we use this term loosely) was something we have never seen before. It was highly illegal, in breach of building codes and trade ethics. While most people want to keep their energy bills to a minimum but, surprisingly, not many take action to do so. Household water heating is one of the biggest expenses of most households. This is why it’s so it’s important to ensure your hot water system is running efficiently, is maintained correctly and serviced regularly. Electric hot water heaters operating on full tariff can be expensive to run. Speak to one of our service technicians about how you may be able to switch to a more economical, lower cost, off-peak tariff. You can also try speaking with your energy provider for advice and options. If you are using solar hot water, check that your booster heating unit is operating correctly and not too frequently. Call us on 1800 266 999 if you’re not sure how to do this. It may sound very obvious, but consider your water usage. You may be using more hot water than you think. Review how long family members and flatmates are spending in the shower. Consider installing a waterproof timer in the shower (available at most department and variety stores). If this doesn’t work, we can install low flow and water saving valves on your taps and shower heat which will also help save water and reduce your hot water bills. Check you don’t have a leaking pipe or any dripping taps. Even a small leak can waste a surprising amount of water. If your hot water bills have increased excessively of late, it may be a signal that you have a leaking pipe. Call us if you think this may be the case as we can run a series of checks that will pick up any leaks. Help, why don’t I have hot water? Should I turn off my hot water heater when I’m on holiday? We recently received a call from a very perplexed customer. 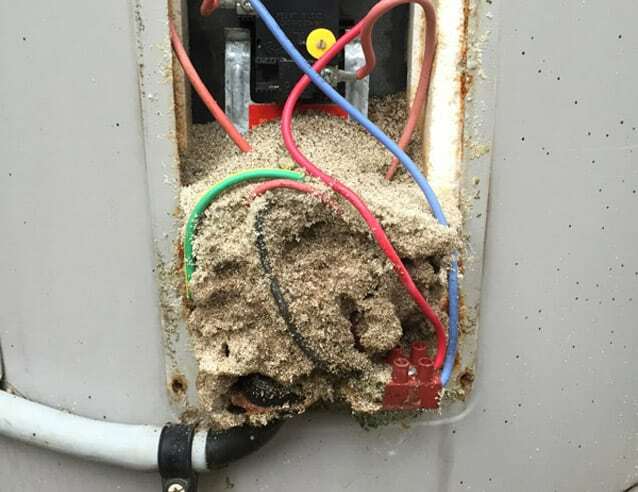 Their hot water system had stopped working and when they opened the observation flap to determine what might be wrong, found their hot water system filled with what they thought was sand. They were very confused as to where the sand had come from as there was no sand anywhere near the hot water heater. Upon receiving the customer’s call, our service technician had an idea of what the “sand” may be and, upon arriving onsite that day, his suspicions were confirmed. Did you know your hot water heater should be serviced every 5 years? Getting your hot water heater serviced every five years ensures your system continues working safely whilst increasing the cylinders longevity, therefore saving you both money and the inconvenience of future breakdown. It’s a small price to pay for peace of mind and trouble free hot water usage. Mention that you’re a past customer and received this e-blast and we’ll extend a $75 discount when you book your next service. A hot water service typically only takes around 30 – 45 minutes. BOOK A SERVICE – Call 1800 266 999 or complete the form below. The information on this website is of a general nature only. We do not make an warranties about the completeness, accuracy or reliability of this information or whether it is relevant to your specific hot water problem(s). For professional hot water repair advice specific to you, contact our Sydney hot water specialists direct on 1800 266 999.